Farkle is also called Zonk, Zilch, 5,000, 10,000, Wimpout!, and Hot Dice. The rules below reflect how my friends and family play. 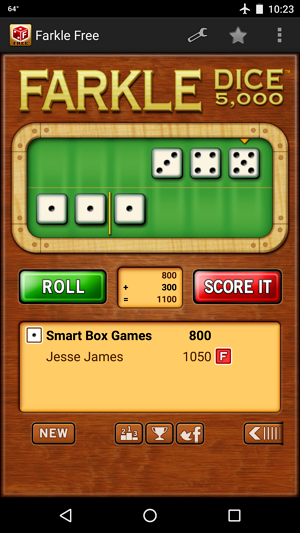 However, since rules vary from family to family, Smart Box Design's version of Farkle allows you to customize gameplay based on the rules used in your home. Score 4, 5, 6 of a Kind - Turn on or off these extra scoring combinations. Play To - Set the final score of the game. Score Three Pairs - You can turn it on or off and set the score value. Triple Farkle - You can turn it on or off and set the penalty value. Must Roll Again (Hot Dice): If all Six Dice Scored - If you select all the dice you must roll again. Show Scoring Arrows - You can hide the arrows above the dice that are worth points. Each computer player has its own style of playing. The computer players are in order of difficulty..